Raise The Roof for Eden Village. Join us at The Complex for an evening of live music, a silent auction, and raising money to help fund Eden Village. 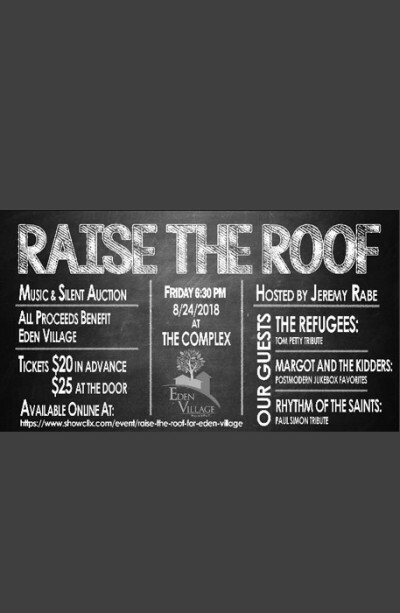 Join us on Friday, August 24, 2018 at The Complex, formerly The Regency Showcase for Raise The Roof, a benefit for Eden Village of the Gathering Tree. The evening kicks off with Margot and The Kidders and their post modern jukebox jazz renditions of some of your favorite music from every generation. Up next, The Refugees: Tom Petty Tribute, featuring some of Springfield's premier musicians. And ending the party is Rhythm of the Saints: A Paul Simon Tribute, the Springfield super group who only gets to perform a few times a year. A silent auction will be going on from 7 pm to 11 pm. Tickets $20 in advance. $25 day of show. Cash bar. Come have a blast from the musical past with us and help Raise The Roof for Eden Village, a tiny home community for chronically homeless disabled people in Springfield.